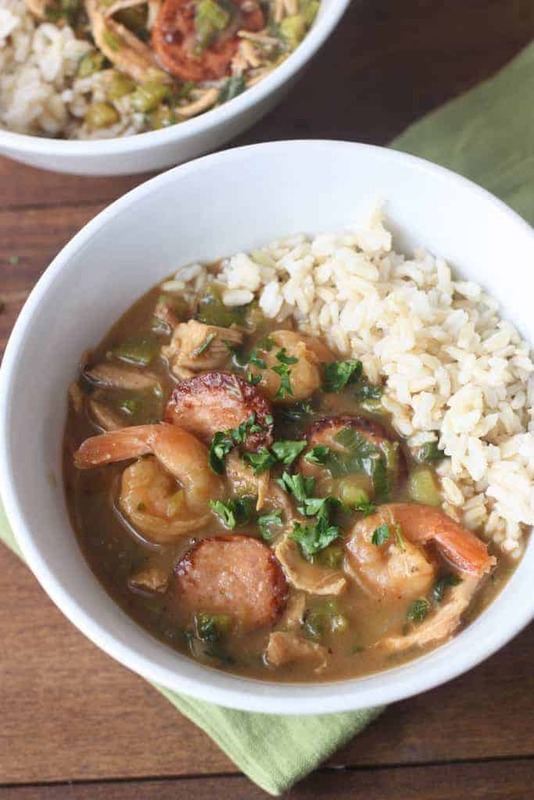 Authentic New Orleans Style Gumbo with a dark roux, vegetables, chicken, sausage, and shrimp! Served warm over rice. We lived by some really fun neighbors in the first house we lived in in Park City. The Dad was from New Orleans and you always knew a special occasion was coming when he started preparations for a big pot of gumbo! The day my mom got the recipe from him was a life changing day for our family! Seriously, this Gumbo is definitely in my top 3 favorite meals my mom makes. And this recipe is totally authentic. Nothing tastes better on a cold winter day. We make a huge pot and enjoy it for days! 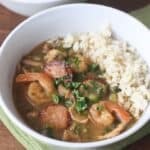 Jambalaya is primarily a rice dish (think paella) while gumbo is more of a stew that is thickened with a roux and made with chicken, sausage, and/or seafood. 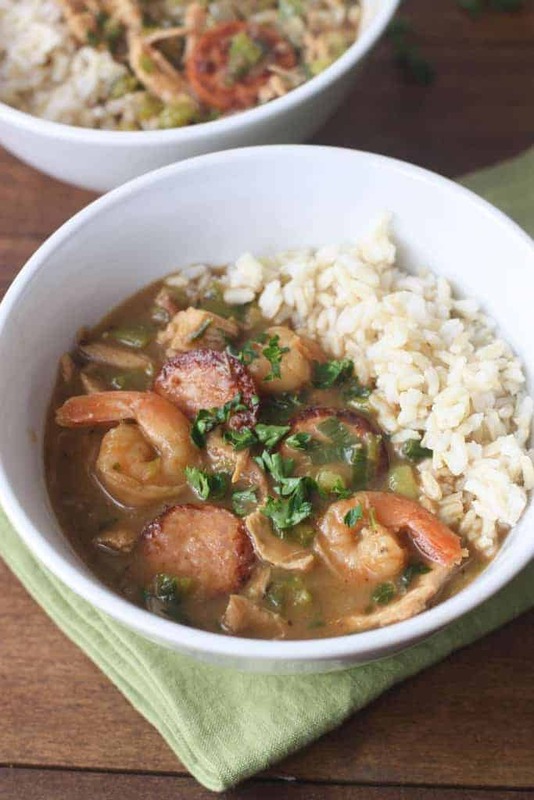 The key to a great gumbo is the roux! With only two ingredients–flour and oil– you probably have everything you need. The important part is to cook it, stirring constantly, until it becomes dark, dark brown almost like mud, or chocolate. You have to be careful to stir it constantly, on medium low heat, so that you don’t burn it. It’s easy, but takes patience. 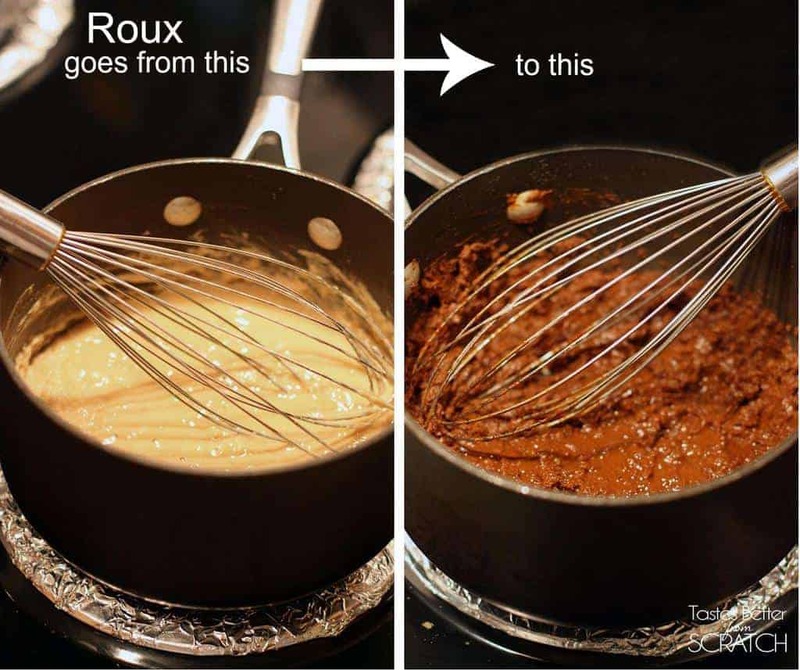 The darker the roux, the richer the flavor! To make this recipe even easier, you can make the roux several days in advance. Allow it to cool, put it in a large ziplock bag, and refrigerate it for a few days. When you’re ready to make your gumbo, start by chopping all the vegetables. As you probably have gathered, I love making recipes that use lots of fresh produce and real ingredients! 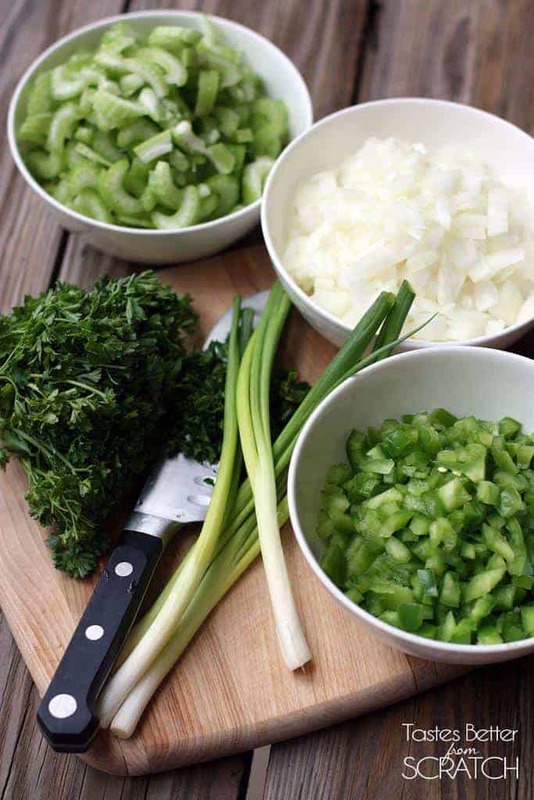 I love the freshness from the green bell pepper, onion, celery and parsley. You can also add okra, if you want. Add it at the same time as the other vegetables. 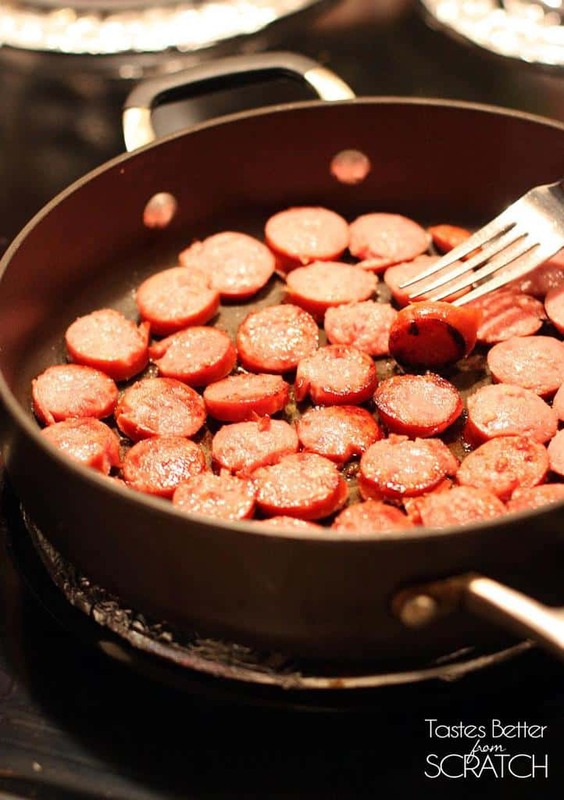 Next, brown the andouille sausage in a large skillet. I lay them in a single layer and flip each one over individually, to make sure they all get nice and brown on both sides. In a large, heavy bottom stock pot combine flour and oil. Cook on medium-low heat, stirring constantly for 30-45 minutes. This part takes patience--when it's finished it should be as dark as chocolate and have a soft, "cookie dough" like consistency. Be careful not to let it burn! Feel free to add a little more flour or oil as needed to reach this consistency. Add 1/2 cup of the chicken broth to the hot skillet that had the sausage to deglaze the pan. Pour the broth and drippings into your large soup pot. Add remaining 5 1/2 cups of chicken broth. Add veggies, parsley, and roux to the pot and stir well. Bring to a boil over medium heat and boil for 5-7 minutes, or until the vegetables are slightly tender. (Skim off any foam that may rise to the top of the pot.) Stir in cajun seasoning, to taste. Add chicken, sausage, and shrimp. *Joe's Stuff Cajun Seasoning--this is my favorite cajun seasoning to use, but I can usually only find it online. You could use another brand. 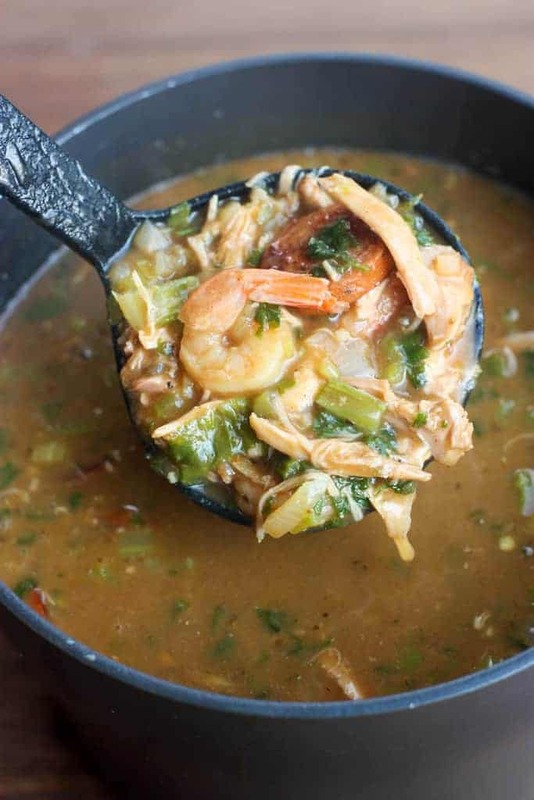 *The best way to make this gumbo is by buying a rotisserie chicken--removing all the chicken, and using the carcass to make homemade chicken stock. Then make the gumbo using the homemade broth. You could use store-bought chicken broth, but homemade is way better! Here's a tutorial for making it from scratch. I made this and it was delicious. I did a few things a bit different. I added the chopped onion to the hot roux to help cool it down as I had to go to an appointment. Upon returning home, I added the celery, green pepper and garlic and reheated the roux. Followed the rest of the recipe except I did cook the shrimp in the gumbo and used store bought bone broth instead of making my own stock. I love this site. It is great to be able to make a meal plan and have the grocery list generated. Thanks for making my life tastier and easier. Would like a bit more steer on what “bunches” of celery, green onion and parsley are. I used 3 green onion “stalks”, about 12 stalks of parsley and most of a “head” of celery and it seems like too many veggies for what I consider Gumbo. If I had used the entire “bunches” I bought from the store there would have been no room for the meat! I ended up using 8 cups of water to try to make more space for the meat, otherwise it would have been quite thick. There needs to be enough room for the liquid! Any steer on what you mean by “bunches” would be great. Thanks. Yes, I use an entire head of celery and an entire bunch of green onion and an entire bunch of celery. You can add more broth at the end, to you liking. This has become our Christmas eve dinner. Just finished making it actually. We have made changes here and there, started making our own Cajun seasoning, but no matter what, this amazing dish is what you can expect and look forward to at our kitchen table come Christmas. My 18 year old says he looks forward to it more than the presents. Thanks for a great recipe that is now a new family tradition. I loved this recipe. I didn’t add the chicken but replaced it with a bunch of crawfish tails. It was really good. I learned a trick to making the roux. I start it in a cast iron dutch oven and once it gets started, put the whole thing in the oven at 350 degrees for an hour and a half. I pull it out and whisk it a couple of times but since it’s not on direct heat, it won’t burn. I love the crawfish modification and the roux trick seems brilliant. I’ll definitely have to give that a try next time around! Thanks for your comment, Rob.